FONTAINEBLEAU, France (AP) — The single line of Napoleon's secret code told Paris of his desperate, last order against the Russians: "At three o'clock in the morning, on the 22nd I am going to blow up the Kremlin." By the time Paris received the letter three days later, the Russian czar's seat of power was in flames and the diminished French army was in retreat. Its elegantly calligraphic ciphers show history's famed general at one of his weakest moments. "My cavalry is in tatters, many horses are dying," dictated Napoleon, the once-feared leader showing the strain of his calamitous Russian invasion, which halved his army. 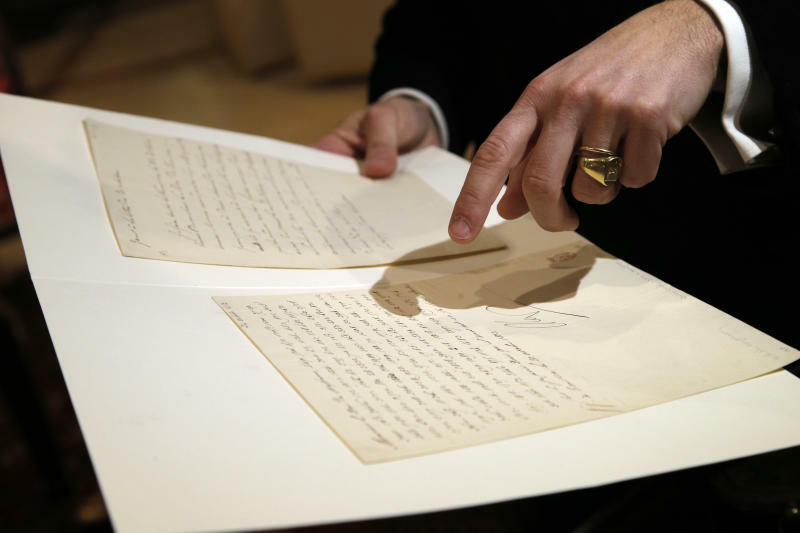 The rare document — dated Oct. 20, 1812, signed "Nap" in the emperor's hand and written in numeric code — is up for auction Sunday at France's Fontainebleau Auction House. 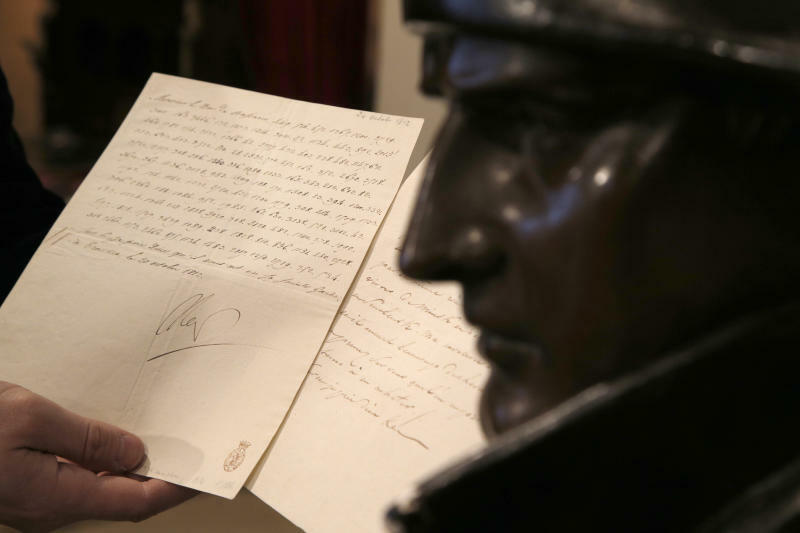 The Napoleon code, used only for top-secret letters when the French emperor was far from home, aimed to stop enemies from intercepting French army orders. The code was regularly changed to prevent it from being cracked. Napoleon must have dispatched his strongest horses and riders to carry the news: It only took three days to reach France's interior ministry — 1,540 miles (2,480 kilometers) across Europe. "This letter is unique. Not only is it all in code, but it's the first time we see this different Napoleon. He went into Moscow in 1812 at the height of his power. He returned profoundly weakened. In Moscow, the Russians had fled days before and burnt down the city. There was no victory for Napoleon, nor were there any provisions for his starving, dying army," says Jean-Christophe Chataignier of the auction house. The only thing left for the weakened leader was to give the order to burn Russia's government buildings — coded in the letter as "449, 514, 451, 1365..."
It is evidence of what historians call the beginning of the end of Napoleon's glorious empire, which started in Russia and ended at Waterloo three years later. In June 1812, Napoleon's "Grand Army" — at 600,000 men one of the largest in human history — confidently entered Russia. But they were woefully unprepared for the harsh weather, the strong Russian defense and the Russian scorched-earth tactics, which left nothing behind to sustain the hungry and freezing French troops. "This letter is an incredible insight, we never see Napoleon emotively speaking in this way before," says Chataignier. "Only in letters to (his wife) Josephine did he ever express anything near to emotion. Moscow knocked him." In the text — which announces that his commanders are evacuating Moscow — Napoleon laments his army's plight, asking for assistance to replenish his forces and the ravaged cavalry, which saw thousands of horses die. In September, 200 years after Russia's victory over Napoleon, the Kremlin held huge celebrations aimed at rousing patriotism among modern Russians. The highlight was a re-enactment of the battle of Borodino — one of the most damaging clashes for Napoleon's troops — which saw thousands in Russian and French military uniforms perform before several hundred thousand spectators. The 1812 victory played an important role in Russia's emergence as a major world power. Until World War I, Napoleon's Russian campaign and the ensuing wars were the largest European military face-off in history. 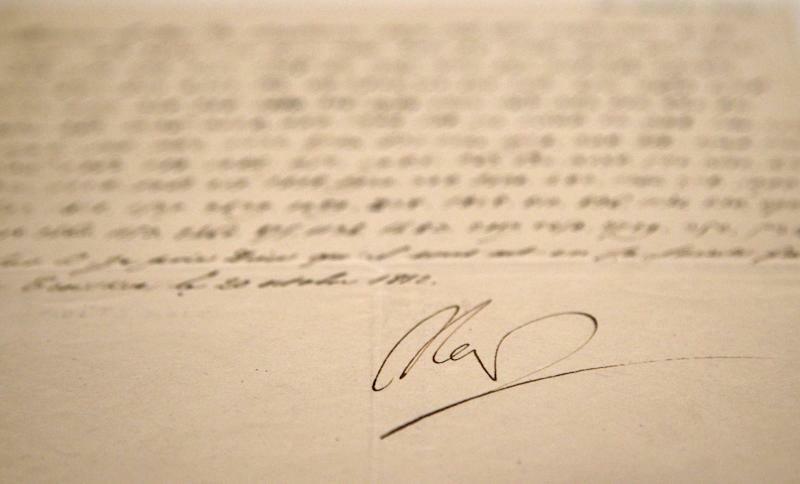 The letter, which is accompanied by a second decoded sheet, is estimated to fetch up to €15,000 ($19,500).